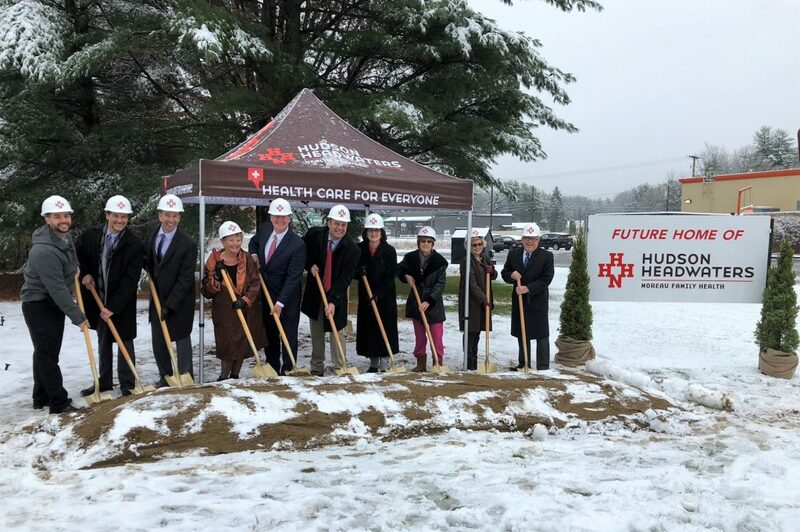 A groundbreaking ceremony was held on Tuesday, November 13, 2018, at the future home of the new Moreau Family Health Center. The new Moreau Family Health center will be built on five acres of land on Route 9, one mile from its current location, and expand from its current size of 4,972 sq. ft. to a much larger space of 24,232 sq. ft. The health center will offer existing services such as comprehensive primary care, pediatrics, women’s health and selected specialties, along with new services such as on-site imaging, lab and pharmacy. This increase in services will enable the patients of Hudson Headwaters and Glens Falls Hospital to access multiple levels of care under one roof. The 24,232 square foot facility was designed by architect Richard E. Jones and will be constructed by Sano-Rubin Construction Services, LLC, with an anticipated completion date in the fall of 2019. 15,578 square feet will be utilized for Hudson Headwaters services. This includes 18 exam rooms, 2 procedure rooms, 1 behavioral health room and space for care management and nutrition. 6,371 square feet will be leased by Glens Falls Hospital to provide medical imaging and lab services. 2,500 square feet will be for a standalone pharmacy that will be constructed later. A pharmacy partner has not yet been identified.